Kravitz annually publishes an in-depth analysis of the Cash Balance retirement plan market, using data from the most recent IRS Form 5500 filings. Our report tracks annual growth in new plans, regional trends by state, asset growth, plan investment trends, and other statistics of interest. We provide this report as a reference for retirement plan professionals, the media, and others interested in learning more about Cash Balance plans. 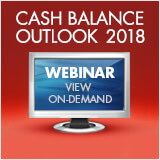 We are pleased to present our 2018 National Research Report as well as our exciting Cash Balance Outlook 2018 webinar sharing market insights, analysis, innovations and best practices based on the latest Cash Balance research findings.